Research by Outlier Ventures says blockchain start-ups have raised $1.8 billion during the first and second quarter of 2018, twice the amount raised for all of 2017 at $900 million. Some 343 deals closed this year they say, with Bitmain alone raising $400 million ahead of a planned Initial Public Offering (IPO). In addition, a number of $100 million or more fundraisers have led to a $1.8 billion total that is significantly higher than all other years. Blockchain start-ups reach a new fundraising record in 2018. 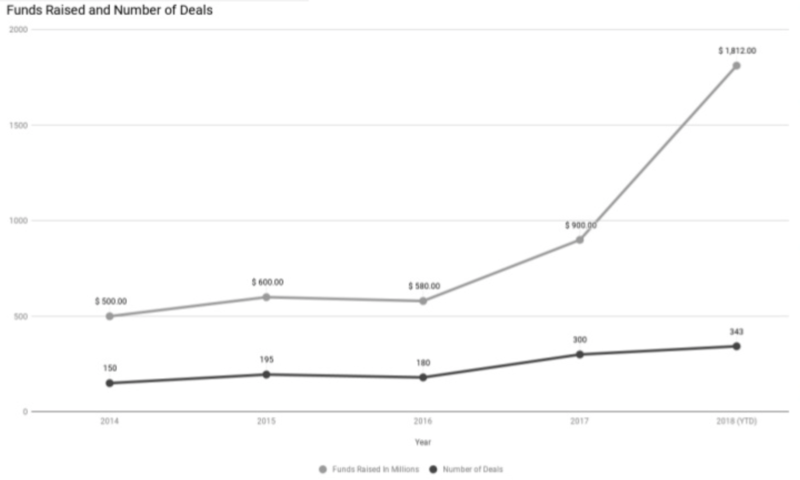 Mergers and Acquisitions are at an all time high, they say, with 30 deals struck this year, seven of them by just Coinbase, indicating this space is maturing, according to Outlier. They cite Tron’s acquisition of BitTorrent for $140 million this July as well as Stellar’s acquisition of Chain for $500 million. Token sales, however, have seen a dip, with “just” $2 billion raised in the second quarter. The slowdown is partly due to the bear market, but also due to regulations. Crypto regulatory framwork ratings by outlier. It’s unclear why they have Austria as red, while China is under discussion. US, according to Outlier, is not just encouraging but favorable in their regulatory framework. The Venture Capital (VC) company argues, in somewhat more objective analysis, that the seeds for mainstream adoptions are being sown. They cite Bitmain’s $50 million investment in Opera, which they say led to Opera announcing an integrated browser wallet. As well as HTC’s launch of a mobile device that integrates CyptoKitties. Dapp usage is currently not very sticky, they say, with individuals not yet forming habits considering just how new these projects are. But new trends are developing, they say, including tokens which have their own funds and funds which have their own tokens. Citing Binance’s and Huobi’s $1 billion fund as well as EOS’ and Tezos’ $50 million fund. In further trends they say stable tokens are hot right now, as are non-fungable tokens, with this space continuing to move at breakneck speed according to the report.